Here is an example of the molecular entities that BIOSYNTH regularly features on its website every week. This month we are focusing on atropine – derived from notoriously poisonous plants yet also a ‘secret weapon’ in the fight against the deadliest toxins in use today. Atropine sulfate anhydrous (Biosynth catalog number Q-200660) is the most commonly used compound of Atropine, which is derived from various plants of the nightshade (Solanaceae) family such as the notorious belladonna (deadly nightshade) and jimson weed. Atropine can be derived by reacting tropine with tropic acid in the presence of hydrochloric acid. In biosynthesis, the process starts with l-phenylalanine, which undergoes transamination into phenyl pyruvic acid. This is then reduced to phenyl-lactic acid that is coupled via coenzyme A with tropine to form littorine. A P450 enzyme is then used to initiate a radical rearrangement to forming hyoscyamine aldehyde, dehydrogenased to a primary hyoscyamine and then subjected to racemization to form atropine. German chemist Heinrich Mein first succeeded in isolating atropine as a pure crystalline compound in 1831 but its pharmacological effects have been known for millennia, largely through its natural occurrences in mandrake, henbane and deadly nightshade (belladonna). Mandrake (mandragora) was described by Theophrastus in the fourth century BCE for treatment of wounds, gout, and sleeplessness, and as an aphrodisiac. In the last century BCE, Egyptian queen Cleopatra is said to have used henbane extracts to dilate her pupils to make her appear more alluring – a practice that continued into Renaissance Italy and even to fin-de-siècle Paris. Around 60 CE, the Greek physician Pedanius Dioscorides recognized wine of mandrake as an anesthetic and soporific for use in surgery. Similar uses of Solanaceae extracts, often in combination with opium, were a mainstay of Roman and Islamic medicine and continued in Europe until the arrival of laudanum, ether and chloroform. Today, Atropine is medically useful as an antimuscarinic-type anticholinergic that can be used to inhibit the parasympathetic nervous system. This supports a range of applications (e.g. treatment of bradycardia and inhibiting excessive secretions of the salivary and mucous glands), as well as therapy for hyperhidrosis. Harking back to Cleopatra, a further typical use of atropine is in eye drops used to eliminate the eye’s accommodation ability in order to facilitate eye examination or treat eye conditions like uveitis. Furthermore, Atropine is an effective antidote against cholinesterase inhibitors, which are found in pesticides, venoms and poisons. In this respect, atropine has played a largely unacknowledged role in some of the highest profile and most challenging treatments today – trying to save the lives of those exposed to modern military chemical and nerve agents like the sarin used in Syria and the Novichok implicated in the attack in Salisbury, UK. While not an actual antidote for organophosphate poisoning, atropine provides a vital therapy that, by blocking the action of acetylcholine at muscarinic receptors, can allow casualties to stabilize and recover. In a developed case of nerve-gas poisoning, maximum atropinization is desirable, if possible used in conjunction with pralidoxime chloride. This is why military personnel likely to be targeted with chemical weapons often carry autoinjectors with atropine and obidoxime, for rapid injection into the muscles of the thigh. 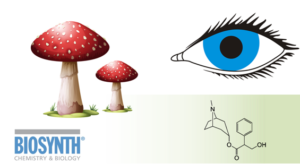 Click on BIOSYNTH Molecule of the Month: 02/18 for more information.